Paris, France – October 25th – From October 26th to 30th, mk2 will present its brand new VR solution for VR esports and multiplayer gaming, the VR Pod Arena, at the Paris Games Week, the French video games summit. Two VR Pod Arenas will be showcased for the world premiere at the Paris Games Week: a first one on the MSI booth (Hall 1, Booth K001), with the title After H (smartVR studio) and the second one on the jeuxvideo.com booth (Hall 1, Booth K020), with the title Space Junkies (Ubisoft). This double exhibition is made possible by mk2’s technology partnership with Intel. After the opening of the mk2 VR, the first permanent VR space in Europe in December 2016, mk2 launched in March 2018 their VR plug-and-play solutions for professionals: the mk2 VR Pod. These end-to-end premium products have already been sold in more than 10 countries (Norway, Denmark, Brazil, Singapore, China…). With the VR Pod Arena, mk2 expands their hardware catalog with a new product, answering the needs of VR esports and video game companies. 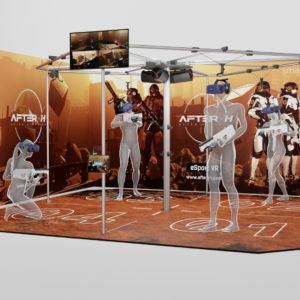 This 4-player solution was conceived for esports multiplayer gaming experiences and VR escape game.Those special VR Pods will be sold with a whole setting inspired from games such as After H, and the most adapted VR technology for operating these titles. With the intention of creating a very complete offer and answering to each and every type of VR actors’ needs, the mk2 VR Pod Arena will be available for order right after the Paris Games Week. The creation of this products follows the partnership with Webedia, announced back in June 2018. This collaboration between the VR branch of mk2 and the French online media group has been settled around the common ambition to make VR esports more available on French television and online media. In November, Webedia’s channel ES1 will be the first TV channel to broadcast a VR competition, the mk2 VR League, organized in the mk2 VR LBE in Paris with pro gamer teams competing on Echo Arena (Ready At Dawn Studio). Based on a FPS gameplay and developed by the French studio smartVR studio, AFTER-H offers a competitive gameplay, opposing 4 to 8 players, with headsets and connected guns for a full immersion. The game will be released in early access on Steam and PSVR platforms by the end of the year, but the game is also available is a hundred VR arcades worldwide, and around 20 in France. Developed Ubisoft Montpellier with the new motor Brigitte, Space Junkies is futurist shooting game in VR, for 2 players vs 2 players in spatial arenas. The fights take place in a place without gravity and the player can move and attack in any direction with customized and merging weapons.